AMAZINGLY --- 83 PEOPEL BOUGHT BRICKS YESTERDAY WHICH GOT US SOLD OUT-- AND THE PAYROLL MADE FOR ANOTHER MONTH !! HOW ON EARTH DID WE GET THIS SDP GOING? I DON'T HAVE A CLUE-- AND THO SERVING VETERANS AND CHILDREN WITH MOBILITY ISSUES LOOKS WONDERFUL ON PAPER, A HUGE PART OF MY INVOLVEMENT IS explaining to teh danes how to be a wonderful useful part of human society instead of just a goofey couch potato. 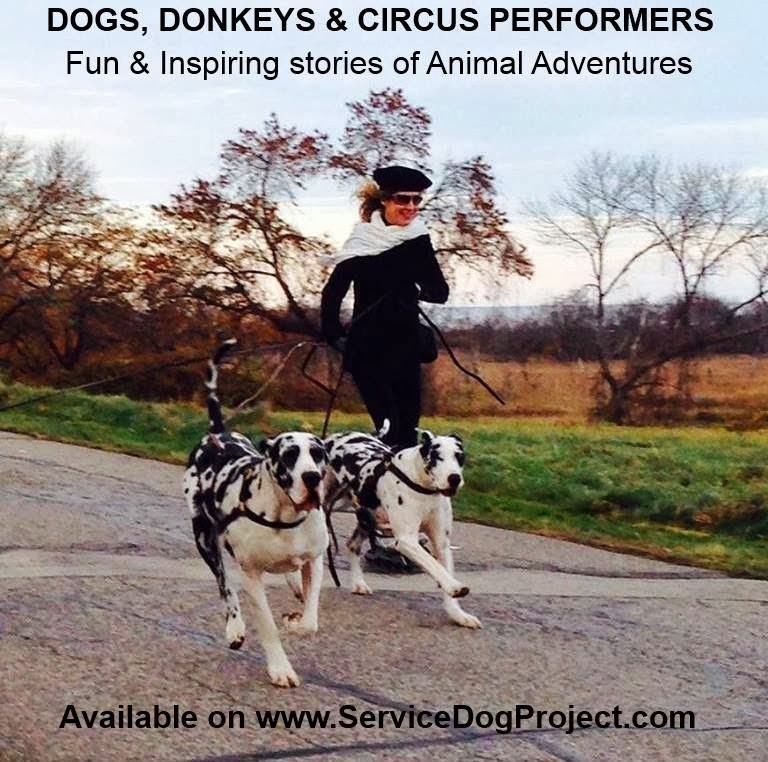 their extreme sensativity to human behavior makes them super service dogs when bonded to their partner. there is a cp who puts comments on pictures with the dog's way of thinking-- who is exactly right- ?yesterday? there was a perfect one working on the stairs in the arena ---somethign like "ok miss devlin... iunderstand where to put my feet on the stairs so when i go with my partner i can reeeeellllyyy help'"
on teh flip side---- i get extremely aNNOYED WHEN OUR DANES SUFFER BECAUSE OF THE REPUTATION ESTABLISHED BY JACK RUSSELLS .. -- TAKE A WANDA TYPE---**p**l**e**a**s**e******- IF THERE IS EVER A DOG FIGHT BETWEEN WANDA AND A DANE, THE DANE WOUL D BE THE WRONG ONE-- POOR LITTLE WANDA GOT PICKED ON BY THAT HUGE DANE-- WHEN FOR THOSE OF YOU WHO KNOW WANDA... SHE AIN'T THE INNOCENT ONE...-- THAT CONCEPT GETS CARRIED TO DOG PARKS ( IF YOUR TOWN IS LUCK ENOUGH TO HAVE A DOG PARK....) 2 TINY DOGS GET IN A FIGHT- AND ALL ANYONE CAN THINK IS THANK HEAVENS THEY WEREN'T HUGE DOGS- SO WE BETTER NOT ALLOW HUGE DOGS IN HERE.. PIT BULLS--IT IS POSSIBLE TO HAVE A WELL BEHAVED PIT BULL-- BUT THE PEOPLE WHO OFTEN HAVE TheM ARE NOT EXP[ERTS IN DOG TRAINING.. MAKING FOR PROBLEM DOGS AND THE REPUTATION GOES DOWN HILLL. IMO---- any dog with those jaw muscles were bred specifically to bite and hang on... they aren't necessarily mean... they enjoy biting they were bred for that. Having recently returned from Dog Fest and volunteering at the farm, this was such a perfect way to satisfy my yearning to interact with a Dane. I was very careful to ignore Charlotte...we did get lots of gasps and looks as we walked through the restaurant...Paul spread her fluffy next to the table and she achieved boredom very quickly. When we finished eating, he said that I, as a CP, was a member of the SDP family and therefore was allowed to break the "No petting" rule.I was able to liberally pet Charlotte and feed her a couple of cookies. I got nuzzled in return...does it get any better? Paul is such an wonderful upbeat guy who has faced so many health challenges, yet manages to keep going with so much positivity. He said he is constantly amazed by the compassion and generosity of SDP nation and can't imagine his life without Charlotte. I also count myself so fortunate to have stumbled upon SDP shortly after the cameras went live. I've never looked back and find joy every day in watching puppies, donkeys, mail call and anything else that happens in the incredible world of Crazy Acres.